Whenever the Corp creates a server, he or she loses 1credit. Whenever you make a successful run on Archives, you may trash Hijacked Router to force the Corp to lose 3credit. Do I really need to explain why this card is good? It is useless against glacier and takes an absolute dump on asset spam. The whenever part of this card is totally bonkers and makes a ton of horizontal focussed ID's very sad. What I do want to address is how hilarious this card is vs Industrial Genomics. 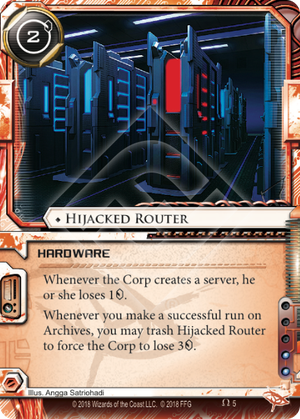 It is like the person who came up with Hijacked Router was like "you know,this card is great. But also, if the runner draws a second copy let them go check archives and make the corp lose three more. And then they go check remotes and trash their assets on the cheap." Talk about adding insult to injury. And I love them for it cause IG can go die in an extra hot fire.